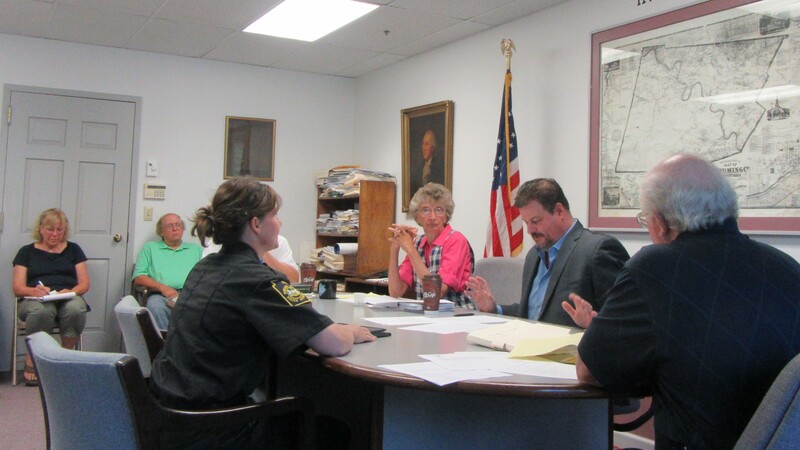 Wyoming County Humane Officer Lisa Devlin (top) told the Wyoming County Commissioners on Tuesday that she had been discredited in her position and asked the commissioners to publicly confirm her legitimacy. 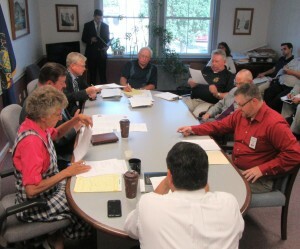 Prior to the regular meeting of the commissioners, Wyoming County Prison Warden Ken Repsher announced a meeting of the Prison Board (above) that overcrowding at the prison and boarding inmates out of county remain serious issues. Every seat in the board room at the Wyoming County Courthouse was full on July 12 as public and press observed meetings of the Wyoming County Prison Board and the Wyoming County Commissioners. The Prison Board meeting, preempted by an executive session during which no action was reported, was brief but reiterated concerns that the jail at Tunkhannock can not adequately hold all of those simultaneously incarcerated by the county’s judicial system. “We are still exceeding our capacity, and that leaves us with no beds,” said Prison Warden Ken Repsher, noting that four recent female intakes were immediately diverted to facilities in other counties. The total of prisoners now in other jails is 14. That is costing Wyoming County taxpayers $910 per day, according to Commissioner Tom Henry. The average cost for boarding out an inmate is $65 per person per day. Repsher reported that there are currently 61 men and 20 woman in the Wyoming County Prison, which was built to hold no more than 80 people. No solutions nor notions that the crisis might soon abate were discussed by the board. The regular commissioners meeting followed with the noted absence of Democratic commissioner Ron Williams, who has been recuperating from a fall. Wyoming County Humane Officer Lisa Devlin was the first to address the board with a request that her status as an official humane officer be publicly reconfirmed. Devlin, one of three humane officers serving Wyoming County, recently learned that she had been removed from the call list at the county’s 911 center. When she asked why, she was given a copy of a letter dated Jan. 4, 2016 apparently drafted by Humane Society of Wyoming County (HSWC) president Janet Shaw. The letter was addressed to the commissioners, the Wyoming County Communications Center, the Pennsylvania State Police, Wyoming County Municipalities, and the Griffin Pond Animal Shelter. The staff at the 911 center, Devlin claimed, were led to believe that she was no longer a valid humane officer. To be a humane officer – a volunteer position – one must be employed by a nonprofit shelter. Devlin had moved from HSWC to Think of Me Animal Rescue, which she maintained did not affect her status as a humane officer. “They misconstrued the letter,” Devlin said of the 911 center staff. “Let them know that I am a valid humane officer.” The 911 center recently received a call about a dog chained to a tree for two days, Devlin related. Nobody responded. Devlin said that she finally heard about it on the sixth day and rescued the dog. Devlin is one of three humane officers serving Wyoming County, the other two being Darrell Sands and Sandy Scala. Henry said that the commissioners were not aware that Devlin had been removed from the call list and noted her participation in uniform during Tunkhannock’s recent Founders Day celebration. Henry assured Devlin that the situation would be remedied immediately. The commissioners read a proclamation acknowledging the addiction and overdose epidemic in Wyoming County and encouraged residents to join together on Courthouse Square on Thursday, Aug. 11 for the Wyoming County Addiction and Overdose Awareness Rally planned by Not One More – Wyoming County. “The rally can shed light on the dark realities of addiction and provide a message of hope and compassion,” the proclamation read in part. Chief Clerk Bill Gaylord reported that Administrative Offices of Pennsylvania (AOP) had committed $7,000 toward an $8,800 project for unspecified security upgrades at the courthouse and District Magistrate David Plummer’s office in Factoryville. “There have been two shootings in courthouses recently,” Henry said of the need for increased vigilance. Gaylord pointed to an emergency call button installed under the board room table near his seat as an example of measures the county has already taken. The “energy project” is winding down, according to Gaylord in reference to a conversion at the courthouse from use of heating fuel to propane and the installation of much smaller furnaces. An audit will be performed over the next winter to determine the effectiveness of the engineers’ efforts. “If it doesn’t work the way it’s supposed to, the company has to give us back what we should have saved,” Gaylord remarked. The weather vane that was blown off the courthouse clock tower during a storm earlier in the year has yet to be replaced, Gaylord noted. Though several tongue-in-cheek proposals have been offered, the commissioners are leaning toward having an eagle repaired and placed on the tower with the weather vane.